Unlike the song’s character, I did not have an English accent (which is unfortunate, as I later learned that North Americans subliminally associate an English accent with intelligence). I did come with a bag of business and management skills, nurtured and honed by doing business in Europe, the Middle East, Africa and Asia. These skills would change fundamentally in this new North American business environment. Change started immediately, with lessons during my rookie years. When I immigrated, I was at the height of my first post-university career, having been part of a leadership team that had turned around a multi-million dollar company. Seychelles Petroleum was a government-owned corporation, solely responsible for the import and distribution of petroleum products in the Seychelles islands. It had small oil and gas storage facilities from which it refueled the local power stations, visiting boats and planes, and also ran a few gas stations spread around the main islands. It was not turning a significant profit and was failing in some of its corporate responsibilities. In six short years, our new leadership team transformed the company into a significantly more dynamic, organized and profitable venture with serious international ambitions. The crowning glory was its first international ocean tanker 'Seychelles Pride'. Even though this was a huge achievement, it should never over-shadow the more fundamental changes we made. Firstly, we proved that an all-Seychellois team could manage a critical oil & gas company without the assistance of expatriates and foreign consultants. We changed the culture of a careless monopoly to be more customer-oriented, and de-politicized it to become profit-focused (anyone remember the old logo?). More tangible changes included investment in new, expanded facilities, one of the outcome’s being to end the "napa gas" (creole for “no gas”) era once and for all. In the process, we helped the government switch people away from widely used, hazardous kerosene stoves. Finally, we moved the company from depending solely on income from Seychelles, and ventured into international areas such as oil-trading, fuel storage services and shipping. My contribution was to lead the change in operations, processes and systems. I did this with no playbook to follow, relying solely on good sense and clear leadership. That’s how I developed my first major management skillset - creativity and resourcefulness – and learned what a typical African manager and businessman has to practice every day! I understood the importance of building good infrastructure for any company, be it IT systems or operating facilities. Among many other skills that were practiced and perfected, I also had to develop strong international business negotiation skills, especially in the new areas we were venturing in. However, the most important skill I gained in those years was learning how to manage people and change the way they think and do things. With these skills and this success under my belt, I did what any sane person would do - I left Seychelles for bigger challenges! I'm generally a very positive person, but my first lesson was a hard one to swallow. A professional from the Africa is not treated as well in the developed world, as a professional from the developed world is treated when working in Africa. Someone from Europe or America is literally given the keys to the house when they come to Africa, often claiming to be experienced or an expert in whatever. However, when we try working in their country - even when we have undeniable proof of our education and experience - they don't even give us the keys to the outhouse, let alone a chance to pitch our abilities! Sixty applications and a few interviews later (some whacked-out ones with questions like: "Have you ever managed people? "), I was forced to take my now-useless British Master’s degree, and start my first job in a call centre! I was used to sales cycles during a calendar year, but nothing as pronounced as what I noticed in the northern part of North America. A few examples that struck me include the construction industry largely shutting down when winter starts. Earth-movers are re-deployed to shovel snow off roads. Retail shops cycle their merchandise from barbecue season to Halloween to Christmas to Valentine’s. Some northern mines in Canada rely entirely on a two-month window to get supplies via ice roads for the entire year. Areas with lakes that bustle with tourists during the warmer months turn to slower business such as snowmobiling and ice-fishing in winter, while the Rockies and similar snowy mountains suddenly boom with skiers and snow sport enthusiasts. I was used to a fair balance of power between sales, operations and finance, with the latter having slightly more power. However, in North America, sales rules! Ignore what you read about the importance of quality control, marketing campaigns, customer service, accounting principles and cost management. SALES drives the agenda of business - both private and publicly-listed! The marketing function is very different to sales, though often has the same power. However, it is the actual selling of products - the actual earning of money - that pays the bills (and salaries). People give top priority and power to sales, especially given intense competition from other sellers. Given the pre-dominant inefficiencies of developing world governments, one often has this image that developed world governments are significantly better. Many spend millions to become more efficient, but generally speaking, self-preservation and political interference impede improvements (simply Google “government consultancy scandals” to see some of these). To complicate matters, businesses often have to comply with requirements at multiple levels of government – municipal (i.e. local town/city government), provincial/state (i.e. the government of the state that the town is in) and federal (i.e. the country’s government)! The division of labour became very clear in this business environment - marketing is left to the marketing experts, sales to the sales-people, any legal document (even the simplest paragraph) is left to the lawyers, etc, etc. Spoilt by the plethora of professionals, consultants, specialists and an abundance of resources, people are not as creative or resourceful – I knew this was going to help me in the long run! I came from the land of secretaries and assistants, but here you are on your own for all your communications. Instead of faxes or phone calls, emails are the preferred mode of communication even between work colleagues located close to each other (incidentally, business emails is what built the Blackberry company). The popularity of emails is in part due to legal concerns, but also due “cover my a**” syndrome. Unlike back in the developing world, North America understands deeply the need for investment in IT infrastructure. That is why IT-related companies such as IBM, CISCO and Oracle have commanding stock-market positions. This is in part because many businesses or government organizations handle large volumes of transactions with a small number of people. It is also because many applications are ‘business-critical’ and, unlike in Africa, something like a cash machine will almost never be left out-of-order! A lot of North American businesses operate within the North American Free Trade Agreement (NAFTA) zone. Even if they depend directly or indirectly on imports from other places like, say China or Japan, they have a poor understanding of how to do business outside of North America. Even governments struggle with how to maintain competitive economies, as their manufacturing bases and IT services move offshore. It’s no wonder that books like Friedman’s “The World Is Flat” become bestsellers. But even 10 years after it was published, North Americans struggle with the idea of a new, competitive, global business landscape. The institution that fails most to grasp the consequences of global competition, it is the unions. One can debate whether unions are still required, now that legislation prevents the labour exploitation and dangerous workplaces of the past. But I was immediately struck by the sense of entitlement of many unions. I eventually learned that unionism is ultimately a business – union leaders negotiate hard, regardless of consequences, in order to attract more people to pay union dues! This self-preservation move rarely involves collaboration with the business owners to combat the real threat – global competition. Ultimately unions contribute to the pre-mature death of their own employers! No matter how much is written or discussed about getting the best out of people, North American managers in both businesses and organizations are largely poor people-managers. The same can be said for managers in the developing world, but the difference there is that 1 low-skilled person can be replaced by another 10 or 20. In North America, not only is there is a larger proportion of skilled workers (remember my earlier observation on the division of labour) but there are more legal hurdles to replacing people. The end result is managers that are poorly trained in how to lead and manage people, especially in an environment of competition and constant change where people really need proper leadership. The answer is ABSOLUTELY. Foreign travel is known to be a positive experience for anyone, and here I was working in a foreign country and using the best of my survival abilities. This makes anyone a better person and a better manager. I had left Seychelles to improve myself, especially in managing on both sides of the global economic divide. I am happy to have achieved that. Kevin, glad to see that you are keeping well. I enjoyed reading your "Englishman in New York or Islander in Toronto" article. It brought back many vivid memories of my own sojourn in the United States, learning the management ropes and becoming successful despite all the odds that are stacked against immigrants. Lessons 3 (sales) and 7 (investment in IT) are indeed the two most powerful ones for me. Your conclusion question as to whether it was worth it is quite powerful. 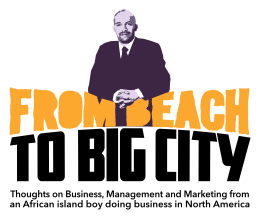 I wish that I could make every Seychellois work at least a year in North America so that they would absorb the work ethics, the customer service ethos and of course the understanding of revenue-generation. In the end, we (Seychellois) are very resourceful people but many today lack the global business exposure let alone the understanding of pressure in a commercial environment. This is why we see more and more foreigners arriving to our shores to start up businesses, let alone the thousands of expatriate workers coming in to fill the jobs that should be done by locals, but instead have to be farmed out due to lack of ambition let alone excellent work ethics. As you and I know from experience, there is no "free lunch" in North America and one has to work extremely hard to become successful. Here in Seychelles, many still believe they are entitled to a free lunch, courtesy of "Gouvernement" and the politicians. Sadly, no one has told them that Government does not sell anything, but rather relies on the hard-working taxpayers in order to "earn" the revenue that they do spend. Anyhow, keep up the great work and I look forward to reading your future articles. Best regards, Marc Houareau - Executive Chairman - VCS Group Seychelles. Thank you for the comment and well wishes Marc. Great to have thoughts from someone who observed 'from the ground' once again, and I sincerely hope these articles will somehow make up for people not working in NA. The sense of entitlement is everywhere: tax-payers of Canada feel that certain ethnic groups exploit the social programs; 15 years ago a friend that owned a business in Singapore was complaining that he had seen local Singaporeans being progressively lazy; BBC recently ran an article on why the "selfie generation" can't find jobs"! Though the same definitely applies to Seychelles, I'm an optimist and think we need to do more. For example, entrepreneurs are the future and they need to be guided to build successful, LONG-LASTING businesses. Another example are the youth just joining or new in the workforce. Managers need to be extra creative in firing them up and get them working for their homeland (I know...motivating gen Y is a still a mystery to most of us). I plan on discussing these in future articles.